We had our first rehearsal yesterday evening. The group is twelve musicians, and I think most of us only knew a small number of the others before yesterday. Georg Graewe, the German pianist, organized the concerts, but he is not playing with us. Saxophonist and clarinetist Tobias Delius is the musical director. Roman Sieweke (from Essen, Germany) is playing alto saxophone. The two trumpet players are Sanne van Hek from Amsterdam, and Liz Allbee, who is from Oakland, but is now living in Berlin. The strings are Claudia Kienzler from Luzern on violin, Katrin Mickiewicz from Berlin on viola, and Helen Gillet from New Orleans on cello. Others are vocalist Almut Kuehne from Berlin, vibraphonist Els Vanderweyer who is from Belgium but living in Berlin, Quin Kirchner (Chicago) on drums, and Jim Campbell, who lives here in Dortmund, is playing this great cassette tape set up. We rehearsed a number of pieces last night and this morning. Some are for the entire group, and others use subsets of the ensemble. The shows tonight and tomorrow promise to be quite varied, and very musically interesting. Seen here are Katrin, Helen, Jim, Els, and the back of Liz’s head at rehearsal last night. 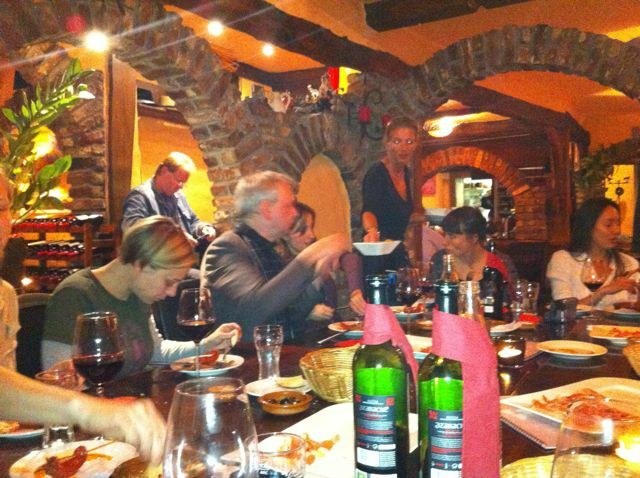 After rehearsal we had a nice dinner at a tapas restaurant near the venue. I love the way a rehearsal and good dinner can make good friends out of musicians who only met hours before. Right to left are: Quin, Claudia, Roman, Sebastian & Nadin who are the behind the scenes folks who are making this happen, and Sanne. Right to left: Sanne, Katrin, Almut, Georg, Liz, and Els’ hand. 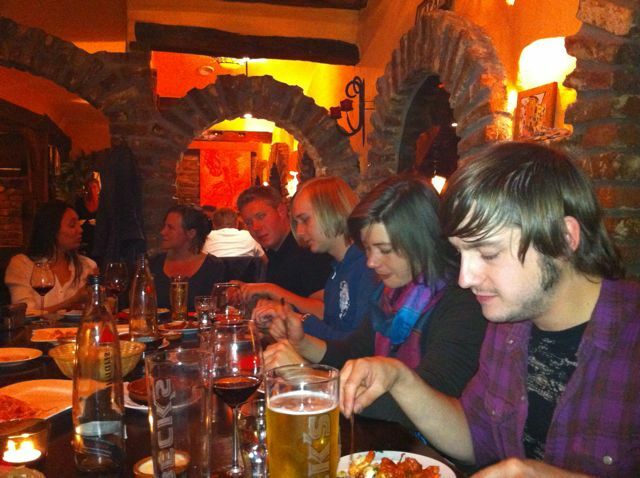 Jim, Helen and Toby were on my end of the table thus avoiding an appearance in the dinner shots. I am very much looking forward to the concert tonight. 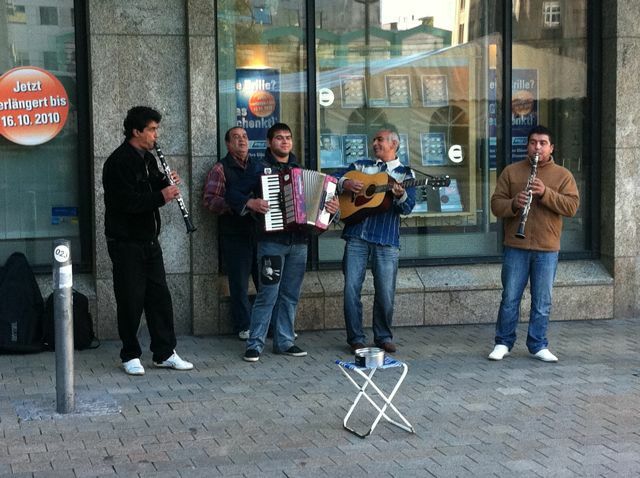 Yesterday afternoon before rehearsal, I heard a bit of a street band near the market. They were playing Autumn Leave when I took this picture. I like getting to Europe a day before I have to do anything to try to get my body on local time, but it didn’t work too well this time. I was awake at 4 am, and ready to go. I’m sure I’ll crash this afternoon at some point. My friend Quin Kirchner, who is the drummer in the Lucky 7s among many other bands, and I were on the same flight from the US. We had a good time exploring Dortmund’s city center on foot yesterday. We scored some street grill food pretty early on. 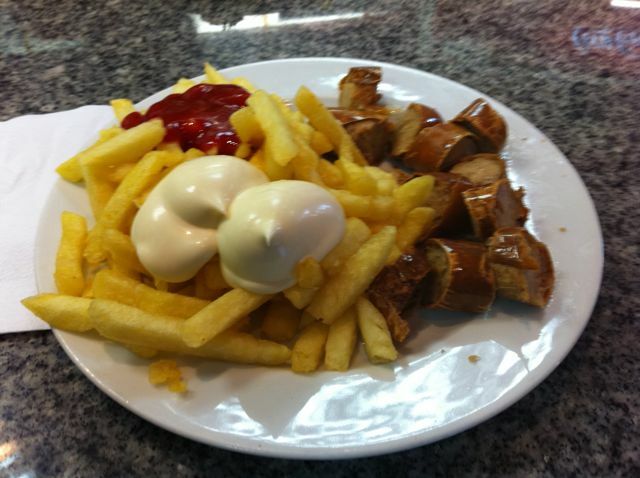 The lady had this very cool bratwurst slicer that made perfect bite size chunks. They do that mayo on fries thing here. Not really my bag, but I try to explore local food customs, so I gave it a shot. 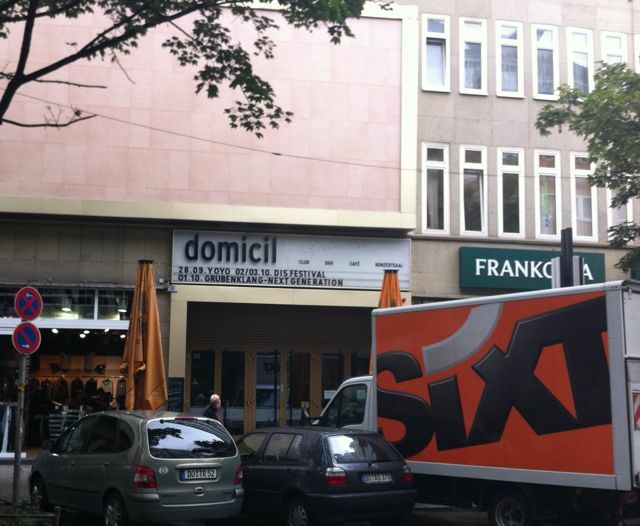 We walked around and found a cool music store, and eventually the club where we will play on Thursday and Friday. We were picked up from the airport by a great guy named Jörg. He told us that at one time Dortmund was second in the world (to Milwaukee) in number of breweries. They have some good local pilsners, and we tried a few. 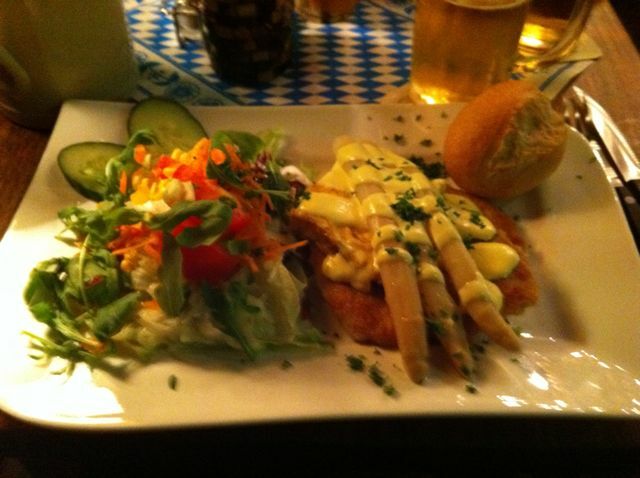 For dinner we went with a place that looked “German” to our tourist eyes. 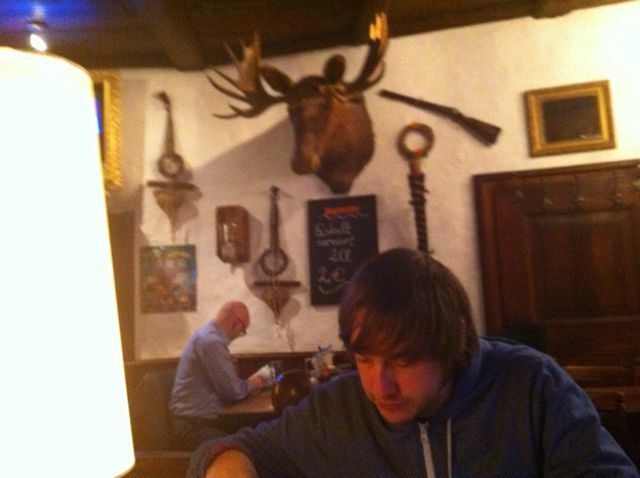 It had a moose head on the wall, and excellent schnitzel. That’s Quin in the foreground under the moose. We also saw a number of signs with (sometimes) interesting use of English words. 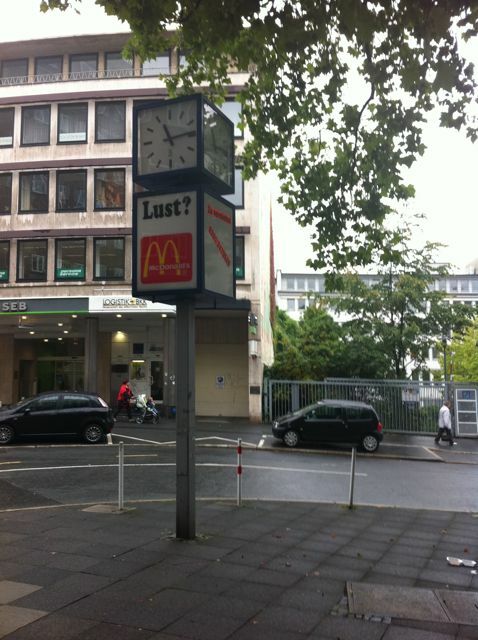 My favorite was this McDonald’s sign near our hotel. 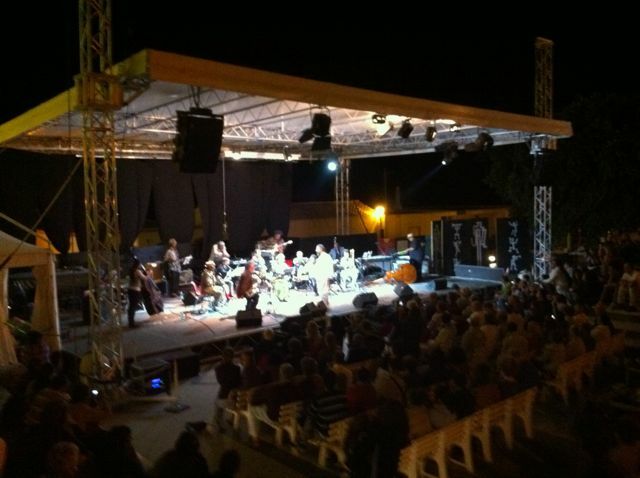 These videos from our show in August in Sant’Anna Arresi, Sardegna, Italy just came to my attention. In the pre-internet days, I wouldn’t have know that Ornette Coleman sat in with Sonny Rollins on Friday night until way after the fact. But this is 2010. As it was happening in NY, I looked at my twitter feed here in Louisiana, and read, “Right now the band is Sonny Rollins, Ornette Coleman, Roy Haynes & Christian McBride. ” Thanks Jason. I am jealous that I wasn’t there, but happy to have at least been cyber aware of the occurrence. First hand accounts are available from Jason Crane and Phil Freeman. 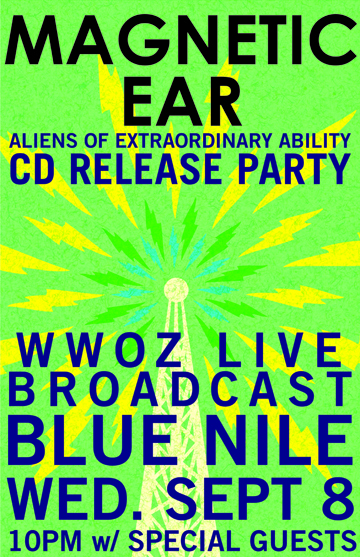 We are celebrating the release of the new Magnetic Ear CD, this Wednesday September 8, at the Blue Nile on Frenchmen St. The first set will also be broadcast live on WWOZ 90.7 FM and wwoz.org. “People tend to have a certain character in mind when they think of the avant-garde musician: the conceited eccentric, blowing silly noises out of his horn in an ostentatious attempt to distance himself—it’s a predominantly male community—from the mainstream musical world that shuns him. Whatever the picture, it certainly doesn’t look much like trombonist Jeff Albert. Jeff Albert Quintet at Open Ears Music Series. Photo by Caitlyn Ridenour. I am writing this on Monday, August 30 in Sant’Anna Arresi, Sardegna, Italy, although depending on the internet connection scene, it might not actually get posted until I get back to the States. I am here to perform with Hamid Drake’s Bindu Reggaeology band. This post is labeled Day 1 (for me), because it was my first day here, even though it was the seventh day of the festival. I arrived in Sant’Anna Arresi yesterday afternoon, after 24 hours of travel from New Orleans to Chicago to Rome to Cagliari (all by plane) then a van ride from Cagliari to Sant’Anna Arresi. Riding through the beautiful but very hilly Sardinian countryside in a van on very little sleep and nothing but airplane food in the previous 15 hours isn’t all that pleasant, but once I got to the hotel and had a shower and a few hours sleep, I felt much better. I got to hear the festival concert last night, which was a wonderful performance. It was Conduction® No. 192 “Possible Universe” by Butch Morris. He had an all-star cast on hand. It was essentially a double orchestra and was placed on the stage in stereo, with one of each instrument to each side. The only musician without a double was Alan Silva on synthesizer. The guitarists Jean Paul Bourelly and On ka’a Davis were on either side of Silva with Chad Taylor and Hamid Drake on percussion to the outsides of the guitarists. Silvia Bolognesi played bass on Hamid’s side, and Harrison Bankhead was near Chad. 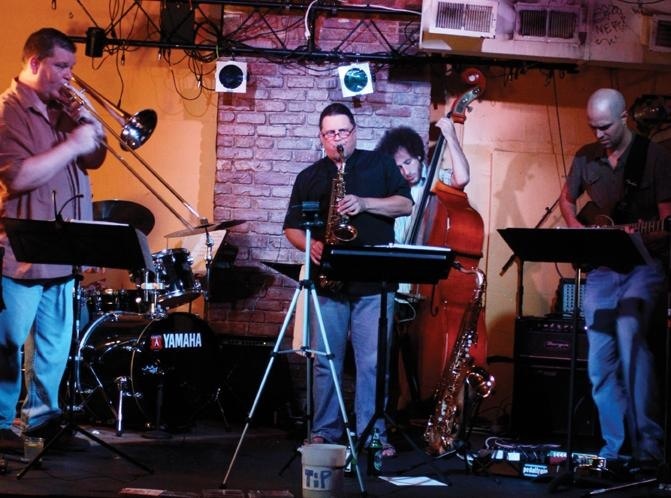 The horns on the Taylor/Bankhead side were Meg Montgomery (trumpet), Greg Ward (alto sax), David Murray (tenor sax & bass clarinet) and Tony Cattano (trombone). On the Drake/Bolognesi side, they were matched by Riccardo Pittau, Pasquale Innarella, Evan Parker and Joe Bowie. I had never seen a Butch Morris conduction before, and it is quite an experience. 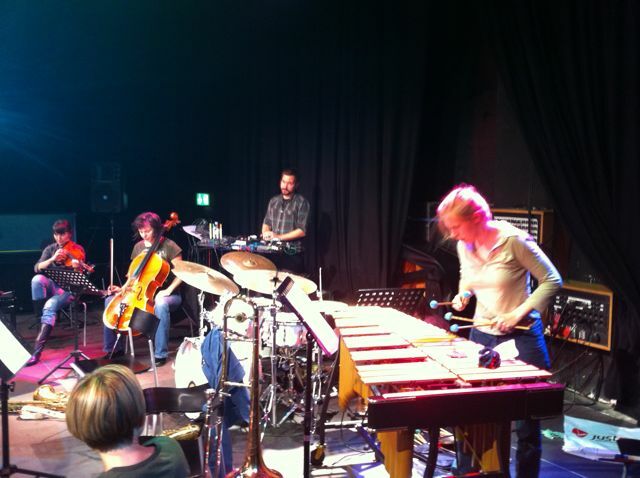 Initially it was similar to some electroacoustic concerts in that I was seeing things happen on stage but was not completely connecting the actions with specific sounds. As the music progressed, I began to be able to connect Mr. Morris’ signals with the musical behaviors that they instigated. He exacts very specific and subtle control over the musicians. When it works ideally, the ensemble becomes on instrument that Butch plays, but that instrument still contains all of the personal sounds of Evan Parker, and David Murray, and Joe Bowie, etc. It was refreshing to see so many world class soloists forego their egos and submit to being part of a beautiful and organic sound that was completely controlled by someone else. It seemed to me that this system requires large amounts of trust going each way, from Morris to the musicians, and from the musicians to Morris. I’ll save the blow by blow description of the music, and simply say that it covered a lot of ground from the quite noisy to the quite accessible, and I enjoyed it greatly. The pre and post gig hangs were great. 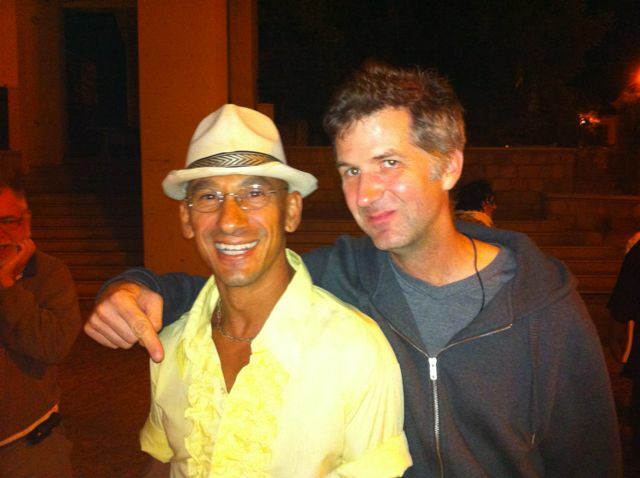 I made some new Italian musician friends. Trombonist Tony Cattano (col lenga?) is a great hang and a great musician. Silvia Bolognesi also plays in the Italian band of Marcello Bennetti, who also has a New Orleans based band in which I play. Tony, Silvia, Pasquale and I explored the ways that musician jokes do and don’t translate across languages. I had the requisite trombonist gear chat with Joe Bowie, who is a warm and personable cat, and got to hear David Murray lay some of his unique “zen” ideas on us. I also got to spend some time talking to Greg Ward. Greg played one gig with a Chicago version of my quartet a couple of years ago. I really enjoy his music and company. He has a new CD that is about to be released, and he laid a preview copy on me last night. I’ll be sure to post something about it, once I have given it a few listens. It was a great evening last night, and I am looking forward to getting to play tonight. (Added 1 Sept) Originally I thought there would be a second post in the series for this trip, but there won’t be. Too much school stuff to do. 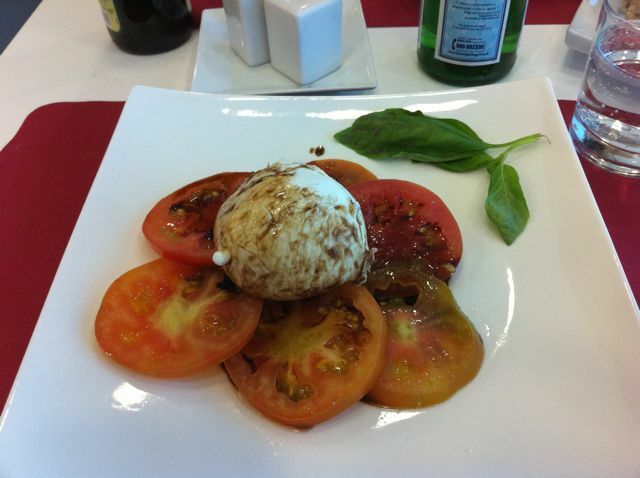 I’ll leave it with, our gig was great fun, Ernest Dawkins and crew sounded great after us, Butch Morris is a very interesting dude and a nice cat to hang with, it takes 24 hours (for real) to get from Sant’Anna Arresi to Mandeville, LA, and the caprese salad in the Rome airport isn’t bad. One more note: beware of the man in the hat. His name is Mack, and he runs a cool little bar, and apparently likes to get musicians loaded. Approach with care.